Synedrex is a diet pill supplement brought to you by Metabolic Nutrition, and is advertised as a product that helps dieters drop water weight, shed fat, and kick food cravings. Our goal is to let you compare the difference between weight loss pills. But does this product work? Our team of nutrition enthusiasts were eager to hunt down and research this product seeing as there seem to be many good things going for it. So let’s see if it’s everything it’s cracked up to be! Synedrex contains two types of fat burners: green tea and garcinia cambogia. Additionally, the product contains chromium, L-tyrosine, L-carnitine, HPMC, cocoa extract, 5-HTP, and jojoba bean. However, much to our disappointment although the two fat burners Synedrex uses are proven to be effective, it is unfortunate that Synedrex does not choose to list the quantities at which they are used. Compare effectiveness of Synedrex with other weight loss pills. Seeing as Synedrex employs a “proprietary blend” they are not required to specifically list the individual amounts of each ingredient, just the overall total. Therefore, our team has no idea how much garcinia cambogia is in the product - which means if they are using it at a lesser percentage than 60% HCA (hydroxy citric acid, the main fat-burning component in garcinia cambogia), the customer will likely see no results. The same goes for the green tea extract. Additionally, there is a lot of caffeine in this product - even for a caffeine pill. Most diet supplements with caffeine in them will utilize about 200 milligrams of caffeine, or about the equivalent of a strong cup of coffee, but Synedrex has 350 milligrams! This may prove to be unpleasant for people sensitive to anxiety, dehydration, jitteriness, and palpitations. Moreover, the price of Synedrex is on the higher end, coming in at $50 for a bottle (compare prices with other weight loss pills) of 90 capsules - and keep in mind, the label suggests taking 4 pills daily, so this is not even a month’s supply! Lastly, we were disappointed from a customer support angle seeing as Synedrex includes with its product no real type of diet plan or exercise routine. Therefore, how is the dieter supposed to know what lifestyle modifications to make in addition to taking Synedrex? 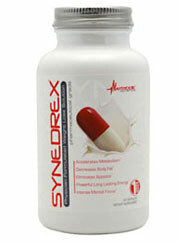 Compare rating of Synedrex with other weight loss arsenal. By this logic, the customer will have to continually take Synedrex to keep their weight down, lest they stop and gain every bit of it back. But be warned this method may or may not take weight off your midsection but it will most certainly take a chunk out of your wallet! May not contain sufficient amounts of fat burning ingredients, has much more caffeine than is typical among diet pills, includes no recommended diet/ exercise plan to maximize product effectiveness. Although it may appear that Synedrex is a quality product with good ingredients, the fact remains that there is just too much uncertainty surrounding it. Anytime a company features a popular ingredient but fails to provide the amount at which that ingredient is included in the product - usually courtesy of a shadowy “proprietary blend” - then the customer should be wary of that product. Additionally, Synedrex has way too much caffeine for our team’s liking and thus people who both already drink coffee and those who do not should be warned of the spike in their caffeine intake that will occur once Synedrex is added to their diet. For $50 you can find something better on the market. Taking all of this into consideration, it is our recommendation that the customer go with a product that lists its ingredients (remember, for garcinia cambogia ensure it is used at HCA 60% or higher), as well as uses much less caffeine in its blend. Bottom Line: Synedrex has all the right ingredients - we just don’t know how much of them are in the product!